← Summer Bonfire in February? As we journey through our Ancients Study, we have covered Geography, Art, Music, History, Poetry, and Science, with a bit of math during the Pyramids. What we didn’t have lined up was Bible. 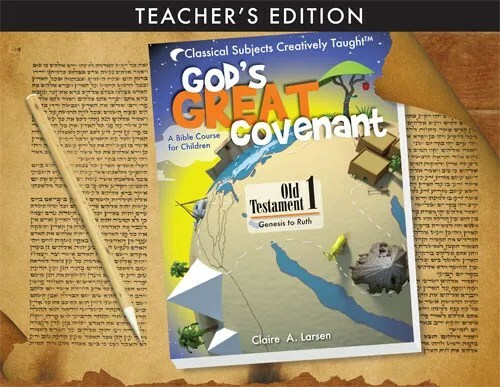 When The Old Schoolhouse Magazine’s Review Crew posted the God’s Great Covenant, Old Testament 1 – Genesis to Ruth , I was excited. Studying the Ancients gets a little spiritually draining with many of the resources available. So many references to millions/billions of years, pre-history speak, and they say so many times, ‘we don’t really know, but’ and go one with fact like offerings. However, we do know when history began. We do know what man did. We do know where they traveled, how and why. And it was written down. 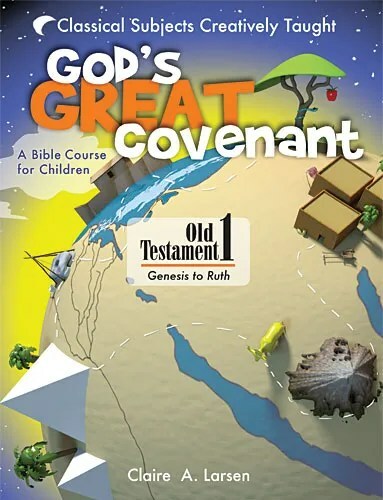 This Bible course for children covers Genesis 1:1 to Deuteronomy as God prepares His people to enter Canaan. 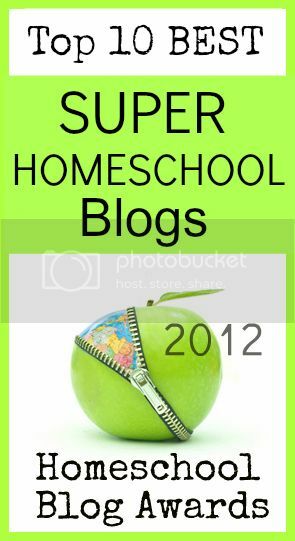 Each page is highlighted at the top to know what type of lesson you are on. Memory Page: An overview. Gives the Scope Theme, Memory Verse, Key Facts, Things to Remember and a Who Is God? fact. Open and easy to read and refer back to. Story Time: A two page story narrative. This is where the MP3’s come into play mentioned above. You or your child may read this aloud, or you could load the MP3’s onto an iPod to have your older elementary do the work on his own. The MP3’s are narrated beautifully. It is like having the Bible on Tape. One of your days is for dance surfing and co-op? Schedule story time for that day’s car ride day. Worksheets: This page is pretty simple to fill out. It is more like a review of what they just read. If they read the Memory Page and listened to the Story Time, then the answers should just pop out, there should not be a need to focus on ‘find the answer’ to fill in the blank. If your child is listening to the MP3’s on his own, or reading the story by himself, this Worksheet would help you know that he is moving along. Chapter Quiz: I would consider this page to make for a great Friday Family wrap up. Maybe when Dad is at the table on Friday he could ask the family the questions? One thing I like in the lessons so far, is that they bring in Hebrew words to remember. Some of those are in the quiz. 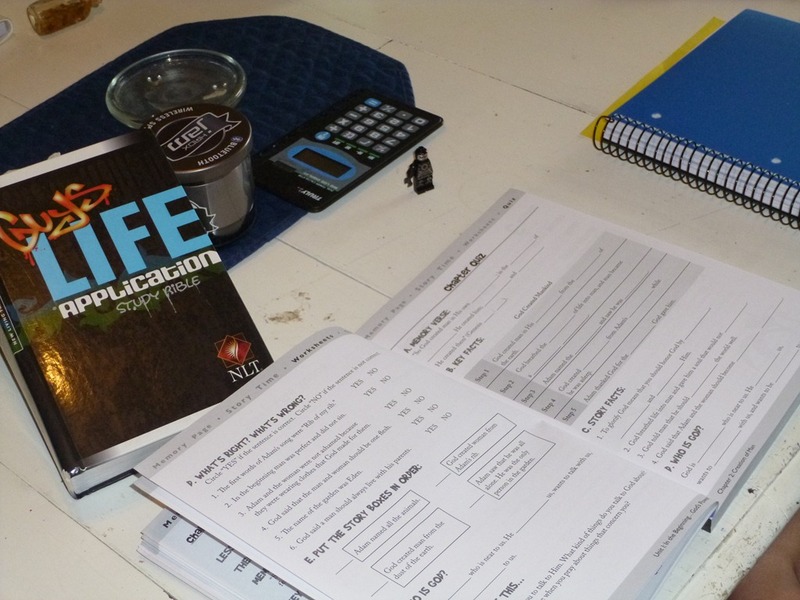 The workbook seems to be designed to really help the 3rd though 6th graders have a Bible study that they can do on their own. The pages top and bottom have great text to help the student know what day/event they are on. The worksheets and pages are in a larger print with generous line spacing and margins for writing. The contents of the study is directly from the Bible, and we had to use our Bible to help us. This is definitely a “Bible Course for Children” and not just Bible Stories. The Teacher’s guide has the answers filled out with extra tips. If you are new to the Old Testament, it might really help. Or on nights when Dad is tired, and wants to give the Friday Quiz, he could have the teacher’s guide so that it is easier for him to participate without being in the study all week. If you are a working mom and have older siblings helping with youngers, this would also be beneficial for them to stay on track. 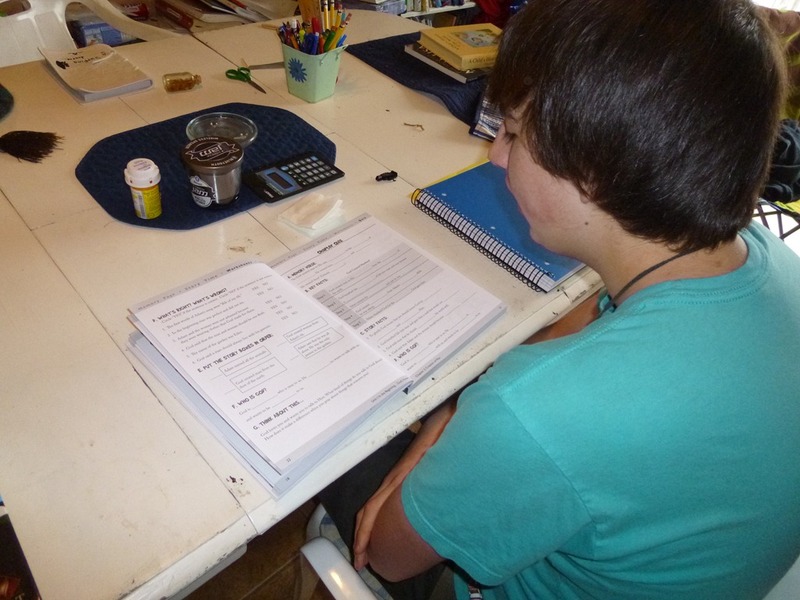 How We Used It: We have been using the workbook for several weeks and the boys enjoy it. I assumed when it said 3rd through 6th that it would be more towards the 6th grade. My boys were late to read, so I always assume workbook lesson are more difficult than manufacturers make them sound like. Now that they are both great reader/comprehenders, and they have studied Genesis in depth, this study was a bit simple for them. They did have aha moments along the way though! Nate was the lead on this one. We did ‘Ancients Bible Study’ once a week. During the course of 45 minutes to an hour he would read the whole chapter. We did the worksheets and quizzes with verbal narration. I have played the MP3’s for the story time on my laptop as reinforcements on days when we are chilling in the living room. Although the workbook is simple to use, it is not ‘dumbed down’. The boys did not feel like they were using younger kid type material, and they liked the content enough that they didn’t want to wait the day between the Memory Page and the Story Time. We will continue through, and may consider getting the second part of God’s Great Covenant. When the boys were learning to read, we had a read through pre-school type Bible. At the end of every story, when man or enemies ran into or created trouble, the next line was always “But God Had A Plan”. It has been a theme on messed up days around here. One of us will say – But God Has A Plan. God’s Power, Promises, Redemption, Provision and Faithfulness. It is good for the youngers to know that God Loves Them. And that God Has A Plan. But it is a far greater thing, for them to know detail by detail, name by name, event by event, how God shows his power, promises, redemption, provision and faithfulness. Pros: All of the above. Cons: If you don’t like to fill out worksheets, do as we did above and have a verbal narration. We did enjoy using the worksheet as a guide to our narration, or have them write in their journals. 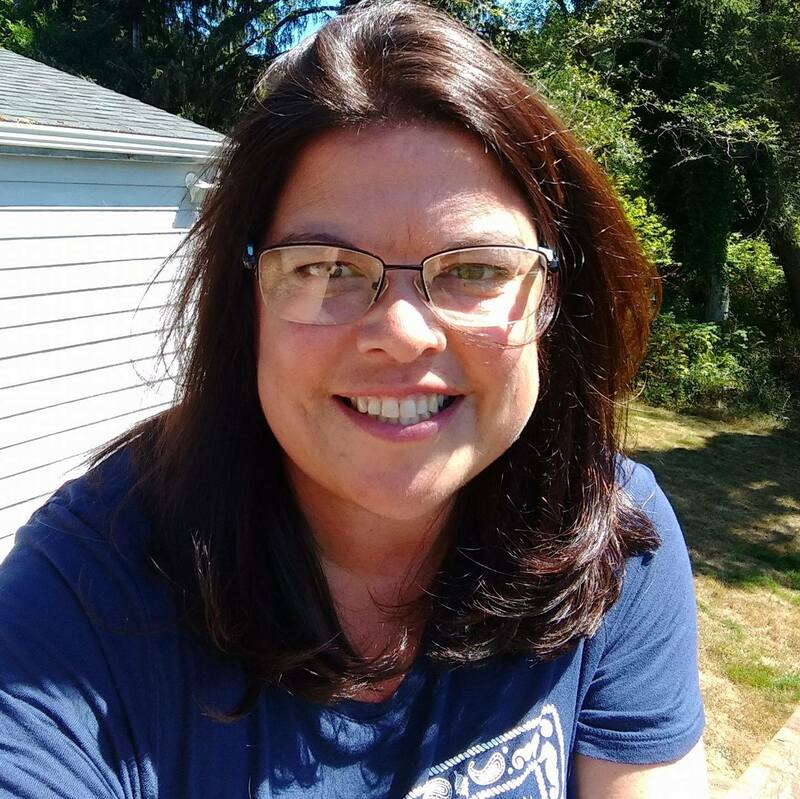 This entry was posted in Bible, Bible Thoughts, History, Reviews, Schoolhouse Crew, Some Schooling and tagged @ClassicalAcadPr, Boys, hsbloggers, hsreviews, Lincoln City, Oregon. Bookmark the permalink.